When the Carpe Diem String Quartet completes this cycle, we will have two excellent recordings of the works to choose from. The relationship between the two cycles is tortuous. The Taneyev Quartet made their recordings for the Russian Northern Flowers label in the 1970s. 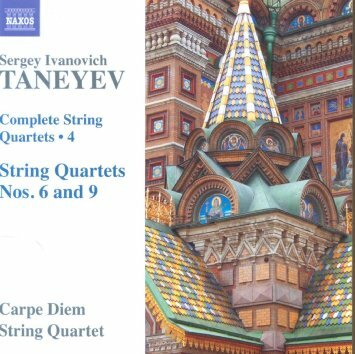 But when the Carpe Diem Quartet began their survey, the Taneyev Quartet version was out of print. The Carpe Diems and Naxos did the repertoire a double service by prompting Northern Flowers to release their recordings on CD, in 2005, no doubt seeking to capitalize on the former’s success. I’ve been torn between the two, but this new release definitely gives the advantage to the Carpe Diem Quartet. The Taneyev Quartet readings are generally slower. They are also more indulgent in terms of rubato and the rich, sustained tone they apply to most of the music. The Carpe Diem versions are cleaner, stricter, and more precise. In fact, Taneyev works well both ways. There is as much Classical elegance in his chamber music as there is Romantic expression, and it is up to the performers to decide which way to take it. But precision and accuracy of performance are not matters of interpretation, and direct comparison between this and the corresponding volume of the Taneyev Quartet cycle (Northern Flowers 9936) demonstrates some very poor tuning in the earlier version. Without the comparison, the Taneyev Quartet doesn’t sound too bad, but listening to the Carpe Diems, it becomes clear just how much the better tuning and ensemble can benefit the music. While the Carpe Diem version is leaner, their readings are highly expressive, and always fully committed. Some surprising portamento stands out in some places (perhaps this is marked in the score?) but it is the nearest thing you will find to an indulgence in either work. The early Quartet Number Nine benefits particularly from the Carpe Diem’s Classicizing tendencies. There is a Mozartian elegance to much of this performance that the Taneyev Quartet completely misses. Quartet No. 6 doesn’t quite benefit to the same extent stylistically, but technical issues give this version the edge. The complex counterpoint, especially in the inner parts, is projected so much better here, a combination of the precision of the playing and ensemble and the modern audio (although the sound on the Northern Flowers reissues is more than acceptable). The earlier recording is longer by over five minutes. Most of that difference is accounted for by the slow second movements of the two quartets. In Quartet No. 9, the Taneyev Quartet gives a sweeping, lyrical account, which I find marginally preferable to the stricter Carpe Diem version—although, in their defense, it is marked Andante. In the second movement of Quartet No. 6, though, the Carpe Diem version is easily preferable. This is one of Taneyev’s great contrapuntal creations, all taking place over a solemn ground bass in the cello. At the Carpe Diem’s faster pace, this bass line really coheres, giving the music an ideal sense of structure and momentum. A fascinating new take, then, on excellent and too long neglected works. Out of the two cycles, my favorite work is the Quartet No. 2, Taneyev’s masterpiece in the medium, and I’ve a marginal preference for the Taneyev Quartet in that work (Northern Flowers 9937). But after that, this recording takes a close second place. Easily recommendable on its own merits, but all the more so on a Naxos price tag.